Patriots Wells Report response: Ball deflation evidence doesn't exist, team says. 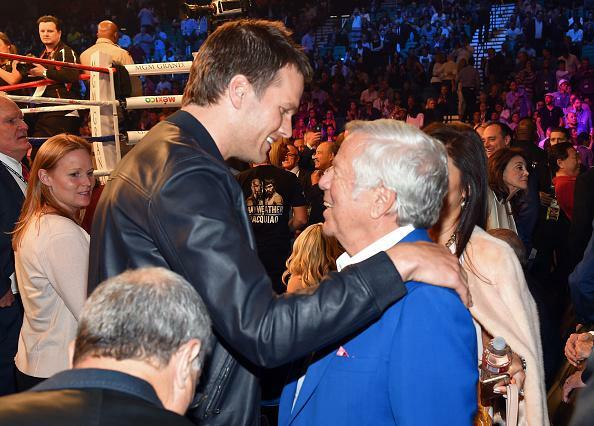 Tom Brady and New England Patriots owner Robert Kraft at the May 2 Floyd Mayweather-Manny Pacquiao boxing match in Las Vegas. Update, 5 p.m.: The NFL Players Association has appealed Tom Brady’s suspension. An arbitrator appointed by league commissioner Roger Goodell will hear the case. Original post, 2:28 p.m.: Eight days ago, the NFL released the so-called Wells Report, the result of a league-commissioned investigation into the possibility that the New England Patriots intentionally violated league rules by excessively deflating footballs used in the January 2015 AFC championship game. The report concluded “that it is more probable than not” that two Patriots employees conspired to deflate the balls below the required pressure boundary and that quarterback Tom Brady was more probably than not “generally aware” of the scheme. On Thursday, the Patriots’ own lawyers released a response to the Wells Report which argues in extensive and (mostly) convincing detail that there is no evidence that any Patriots employee, including Touchdown Tom, broke league rules. 1) Science. The Wells Report’s scientific consultant argued that “no set of credible environmental or physical factors … completely accounts for the Patriots halftime measurements or for the additional loss in air pressure exhibited by the Patriots game balls.” The Patriots’ lawyers, citing a report by a Nobel Prize-winning chemist (! ), argue that this is false. They point out that game officials used two different pressure gauges to test the Patriots’ footballs, observe that the gauges provide different readings of the same balls, and note that the league is not entirely sure which gauge was used for pregame measurements. The team notes that the official who measured the balls before the game believes he used the gauge that consistently gave higher results, and says that based on the measurements from that gauge, all observed deflation between pregame and halftime can be accounted for by the natural reaction of the air in the football to colder outdoor temperatures and other environmental factors. 2) The lack of smoking gun in re: violating league limits. The Wells Report asserts that references to deflation and to Brady’s preference for softer game balls in the texts exchanged between two Patriots employees are indication of a conspiracy to violate rules. The Pats’ report observes—as far as I can tell, correctly—that none of this correspondence ever refers or even alludes to deflating balls below the league’s required lower boundary. The Patriots concede that Brady prefers balls inflated to the lower end of the allowed pressure range and that their employees discussed said preference, but there does not appear to be specific evidence that going beyond the lower boundary was ever discussed. 3) Misinterpretation of evidence. This is probably the least convincing angle of the Pats report and it’s been getting a lot of grief online already: The team argues that references to “deflation” in texts between team employees referred, on some occasions, to an employee’s desire to lose weight. This has struck many observers as a bit ludicrous, because very few people refer to losing weight as “deflating.” The team also argues that the NFL’s lawyers were predisposed to believe the Patriots had cheated, though it doesn’t have specific evidence of, say, league officials or investigating lawyers making public or private statements indicating prejudice. 4) Peeing. The league identifies a 100-second bathroom break taken by a Patriots equipment employee before the conference championship game as the time when the balls could have been deflated. The league’s scientific consultant says it’s possible for 12 balls to be deflated in this time period. The Patriots argue that such deflation would at best be very difficult and also that the employee went into the bathroom because he needed to pee. The league has suspended Tom Brady four games, docked the Patriots two draft picks, and fined the team $1 million for their alleged shenanigans. Those penalties are expected to be appealed to an independent arbitrator. And in sum—at least to this observer, who is mildly biased as an occasional bandwagon Patriots fan—the league’s case does not look strong. They have a lot of circumstantial text evidence that requires interpretation to be seen as an indicator of malfeasance, and they have hastily made measurements using gauges that do not seem to be particularly high-quality pieces of equipment. Even using the league’s applicable standard for finding rules violations—“as a whole, the fact sought to be proved is more probable than not”—it’s hard to picture an arbitrator finding on their behalf.